100s of villagers have quit their homes in central Nigeria ahead of a planned army raid on suspected militant hideouts, over recent attacks that killed more than 100 people, the army said last night. “Hundreds of them have left as of this evening,” spokesman of the Special Task Force (STF), army Captain Salihu Mustapha told AFP. “As a matter of fact, most of them have complied with the order to vacate these five villages,” he added. The military operation could commence “any time from then”. Officials have accused ethnic Muslim Fulani pastoralists of being behind a series of attacks in central Plateau state last weekend. In the first wave of attacks on Saturday, July 7, gunmen stormed mainly Christian villages and killed more than 80 people. Another 22 people, including two senior politicians, were killed the following day in an attack on the funeral of the previous day’s victims. 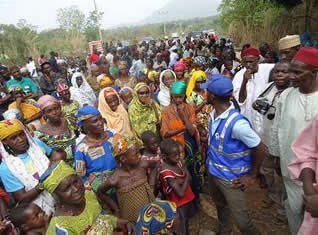 Troops from the STF had already been deployed to several villages in Plateau state, Mustapha said. Responding to fears that homes vacated by residents would be destroyed in the fighting, Iruenabere said small weapons would be used during the operation. Ethnic Fulani herdsmen are a majority Muslim group with long-standing land rights grievances against the state’s mainly Christian leaders. In March 2010 they launched a wave of attacks on Birom Christian villages, slaughtering more than 500 people, according to local officials. Plateau state is in Nigeria’s so-called “Middle Belt,” where the mainly Christian south meets the majority Muslim north, and has been the site of sectarian violence in recent years. Fulani pastoralists are seen as “settlers” by the Christian ethnic groups that dominate power in Plateau state, even though the Fulani have been there for decades. The state capital Jos and its environs have suffered a wave of sectarian and communal clashes in recent years that has left thousands of people dead. A meeting of Plateau state stakeholders held on Monday in the state capital Jos to discuss the current security challenges facing the state, an official statement said.